My studio is located in Tulsa, just north of 51st street, near Lynn Lane & 48th Street. Shakespeare called music “The Food of Love” – but it’s much more than that. A child who studies music shows increased development of the parts of the brain that govern mathematical and engineering abilities. The discipline of practice will benefit any other pursuit in later life. I developed a love for the violin at the age of 9, when I began my own study of the instrument. 7 years years later, I became concertmaster of my high school orchestra. I was a member of the El Paso All-City orchestra, the Texas All-State orchestra, and during my high school senior year, the El Paso Symphony Orchestra, and concertmaster of the Baylor Summer Symphony. That year I also won the El Paso Music Teachers’ Award For Outstanding Violin Performance. Since that time, I have performed with several groups in the DFW area, including Threadneedle Street and The Old Crusty Minstrels. 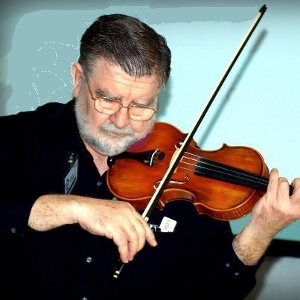 My favorite genre is Celtic music, but I also teach various other fiddling techniques. Up until I moved to Tulsa, I was a member of the NTSO. I am currently in the Tulsa Community College Orchestra. My teaching experience includes substitute teaching for the Austin Independent School District, technical course presentation, and teaching continuing education classes for Collin County and Richland Community Colleges in the Dallas, TX area. My philosophy is that music should be FUN, and I emphasize techniques for getting the best possible sound from the violin. I teach a variety of styles, but I start all beginners with classical technique (including reading standard music notation), because that is the most versatile. I do not use the Suzuki Method, although I use some of the Suzuki materials (I find the Suzuki editions generally higher quality than some other publishers). Private Lessons are $20/half-hour, payable monthly in advance. I offer a discount for more than one student in a family. I can also advise beginning students on instrument selection. There is no charge for an initial interview with prospective student. Minimum age for private lesson is 6 (first grade). For students under the age of 12, a parent or guardian should attend* each lesson with the child. I also accept adult students at any age. 10% discount for two or more students from the same family. I was affiliated with Music Learning Unlimited in Plano, TX until the end of November 2006, when the school closed. I taught at my residence in Plano, near Custer and Cross Bend until June 2014, when I turned my studio over to a friend and fellow member of the NTSO in order to pursue some contract opportunities. Now that I have settled for a few years in East Tulsa, I have set up a studio here. To arrange your free initial consultation, call (918) 416-1420 or email celticfiddler@gmail.com today. Parent of student under 12 years of age is expected to take notes and learn to tune the instrument, and should be willing to commit to supervising regular practice with the student. This is an enormous help to the younger student. You are also encouraged to bring an audio or video recorder to at least one lesson each month — it makes a wonderful record of the progress of your child. Students need to bring a spiral or ring-binder notebook in which to keep notes and assignments. I no longer rent instruments, but I have a limited selection of student instruments for sale.